Here's a piece of terrain I worked on this evening. 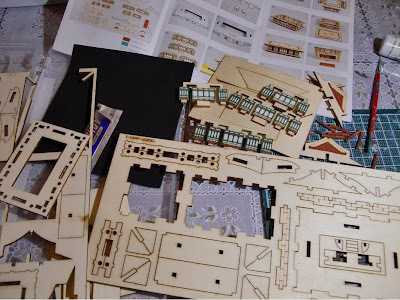 It' s a laser cut wooden kit from Korea picked up off of ebay and arrived surprisingly quick - about a week and a half - during the Christmas mailing season no less.. Most of the parts fit together without the need for gluing as the laser cutting is very precise. 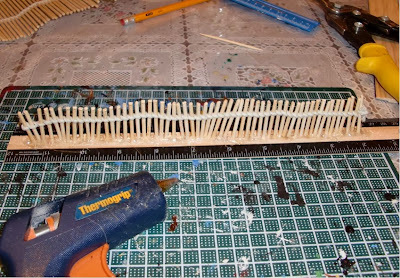 The roofing was the only area requiring a bit of glue. 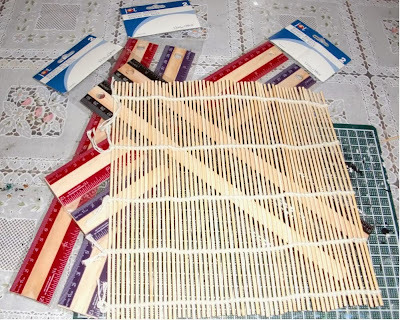 The roof tiles are from a supplied sheet of rubber mat that is easily cut with a hobby knife using the templates provided. 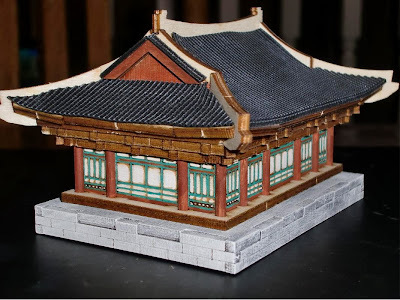 The only parts painted were the stone foundation, arch of the roof, wooden pillars and the sliding doors. 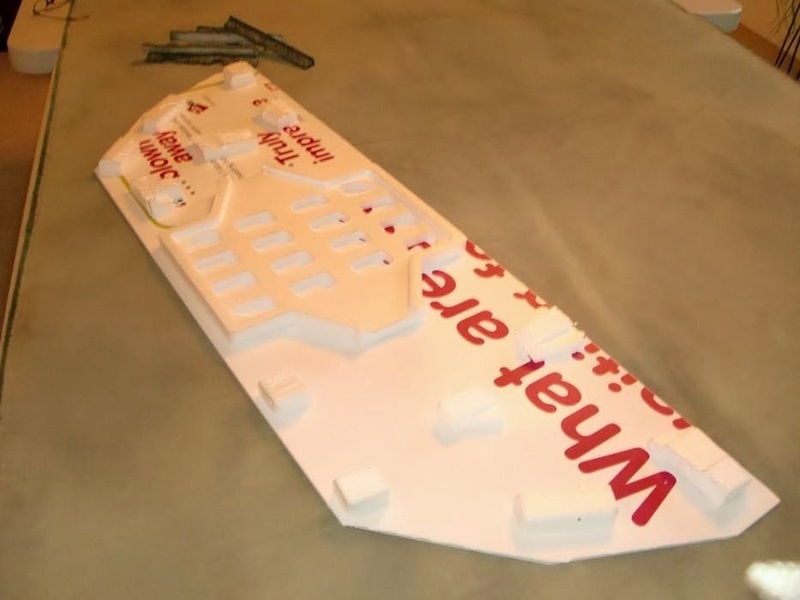 Alternatively, the kit can be left unpainted too. The kit comes in a clear, hard plastic case and with very good full color instructions. The cover states the kit is aimed at 12 and older; but the suggested time for building is way off, at least for me. It says it can be built in two hours. I think if you have already built a few and are familiar with the construction - as well as not painting it, it may be possible. For me, it took about twice as long - mainly due to the painting. That said, it isn't a difficult kit to put together. 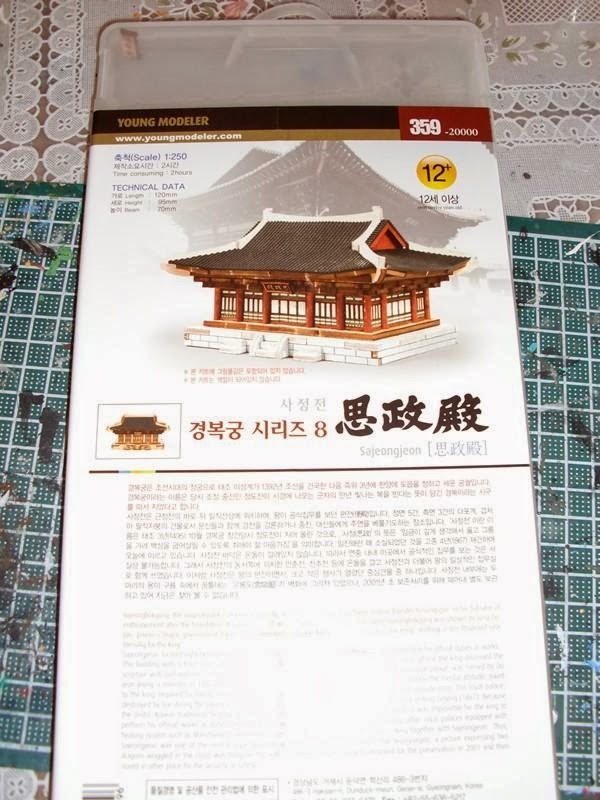 But here's the kicker - the kit is a 1/250 scale replica of the original palace of the Joseon Dynasty - Sajeongjeon. 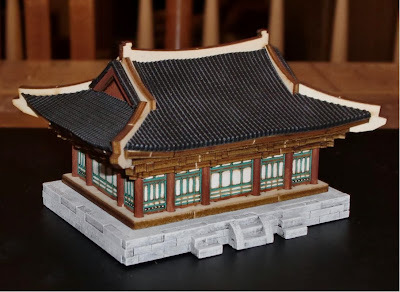 It is probably good enough as a temple for 15mm, but for 28mm it will have to be a facsimile for a small shrine. The same company that makes this kit also sells larger scaled versions, but they cost about twice as much as this one. As most of the terrain for the Imjin set up are more representational than "true-scale" it should work. I might also raise it a bit to give it an illusion of size. Anyway, just a brief post to keep the blog going. 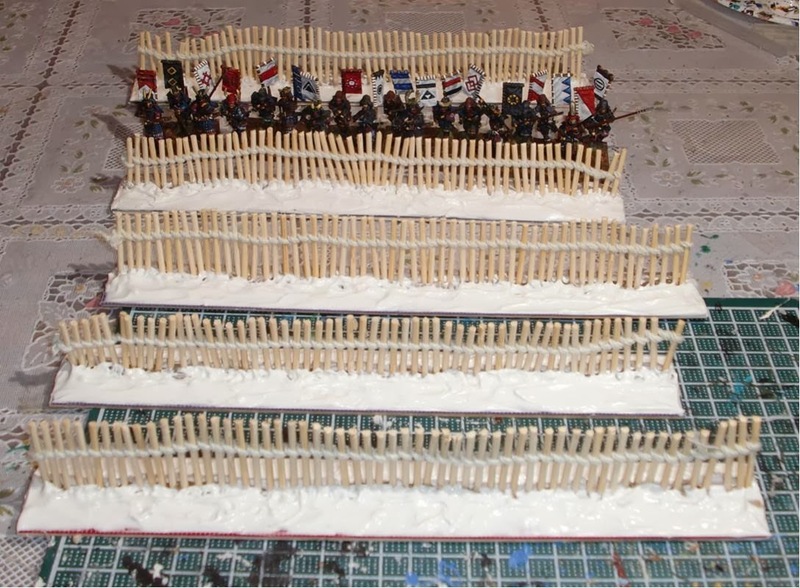 Finished the outer barricade of stakes, as well as basing the cavalry on stands of three figures each. Here are some shots of the units staged as they might be in the final assault of the Japanese. 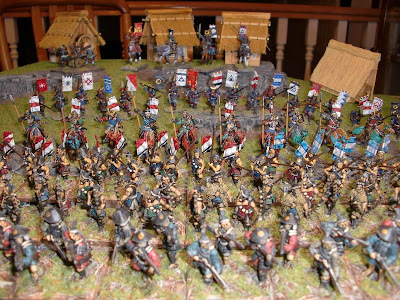 The light troops (bowmen and teppo) are on stands spaced about an inch apart to reflect them in open order. 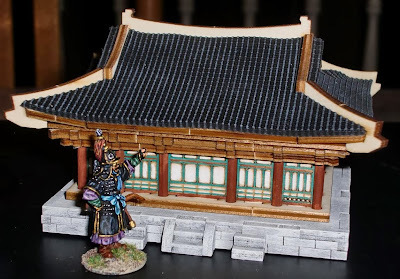 General Kwon Yul with the reserves and Hwa Cha batteries behind the stone walls of the ancient fortress. 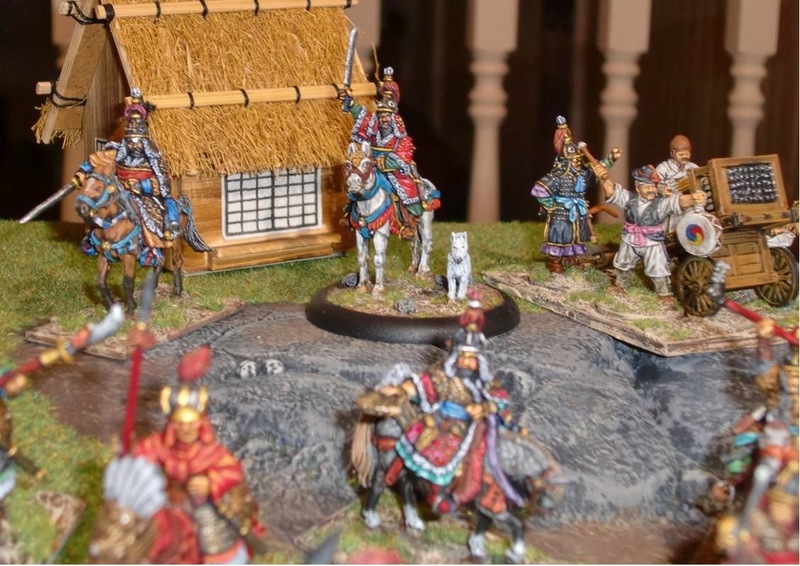 Samurai cavalry move up - General Kuroda Nagamasa surveying the action to their left. 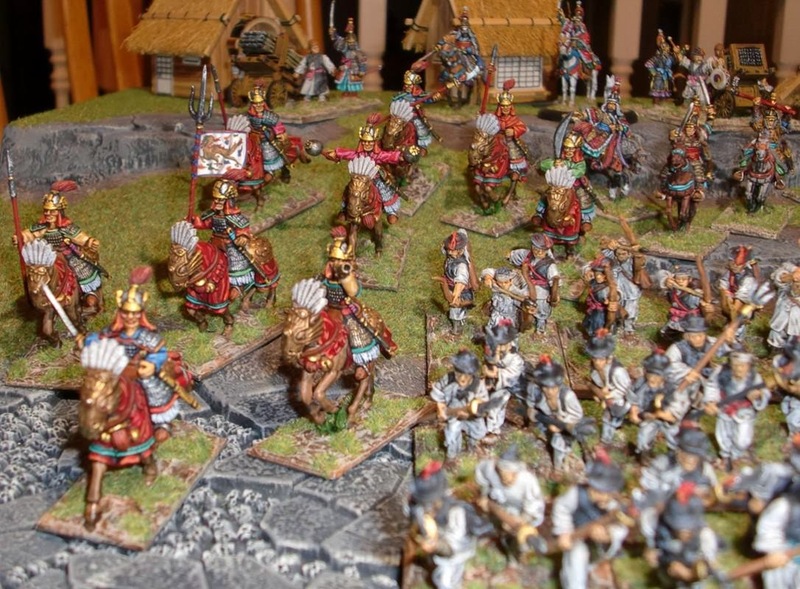 Ming heavy cavalry move on the right flank (not part of the actual historical battle). 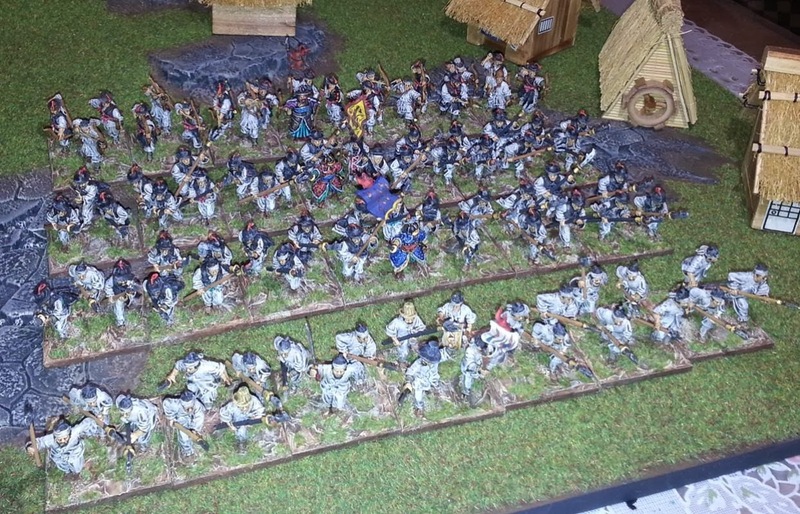 Right flank of the Japanese - spearmen and foot samurai supported by open ordered teppo and archers. Close up of the outnumbered Koreans behind their protective barricades. A play test will shortly follow. Thanks for visiting the blog! 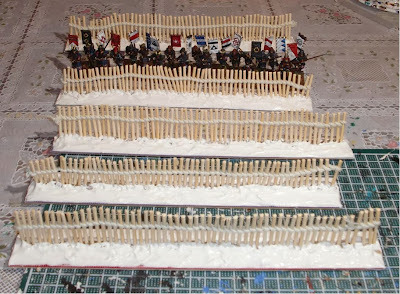 Here are some WIP shots of what will be the outer barricade of stakes General Kwon Yul ordered built prior to the arrival of the Japanese. 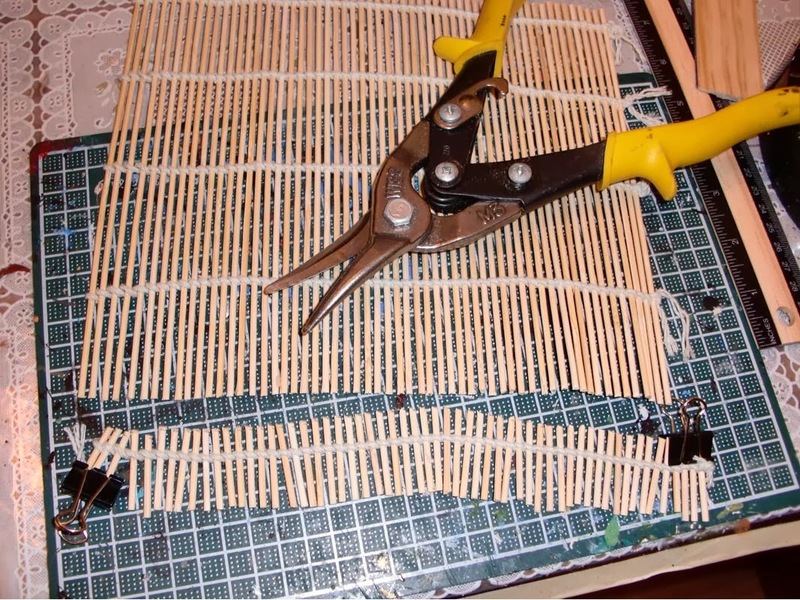 They are built using bamboo sticks from a sushi roller my wife let me have. I need to buy a couple more - one more to complete the walls and one to replace the one I cut up. Perry Samurai for height comparison. 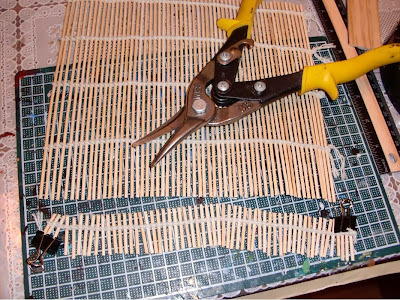 A pair of metal shears were used to easily cut the bamboo. The only trick was to keep the ends of the sticks from trying to unwind off the string. I used some clips to hold them in place - but tape could just as well be used. 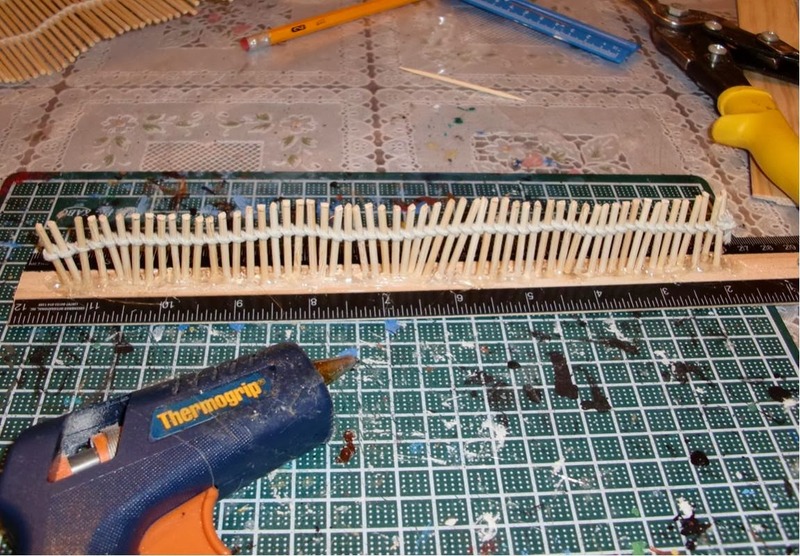 A trusty old glue gun (formerly owned by my wife) was used to secure the bamboo to the ruler. Finally acrylic caulking was spread over the base. All in all, I'm pretty happy with the way they turned out; and they were done rather quickly as I just worked on them for a couple of hours after work tonight. Below is a detail from a painting in the Seoul War Museum depicting the fighting around the outer barricade of stakes during the Siege of Haengju. The ground was probably snow covered as the siege took place in February - still the dead of winter in Korea. For the Imjin War game, I decided to go with the Siege of Haengju. It involved the successful Choson Korean General Kwon Yul and several famous Japanese generals, including Kuroda Nagamasa - two figures I have already. One of the three most-celebrated Korean victories during the Imjin War, this battle took place a little north of Seoul, which the Japanese had already captured and occupied. Actually, the Korean king and his retinue had already fled the capital before the Japanese arrived. Kwon Yul with a small force of regular troop moved to an old hilltop fortress near the village of Haengju. 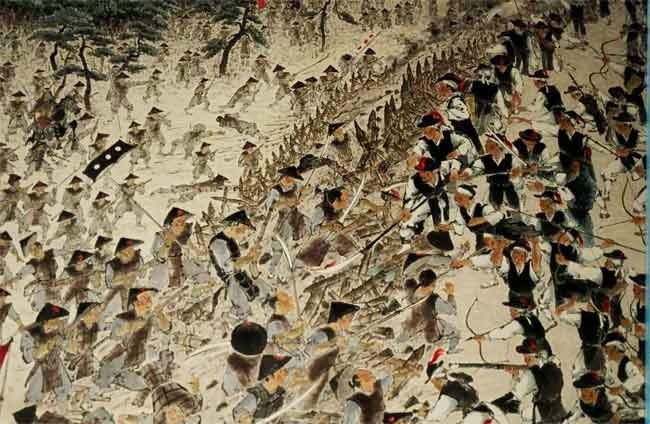 It was here that the Japanese, greatly outnumbering the Korean defenders, decided to wipe out any resistance before the Ming forces arrived as reinforcements. 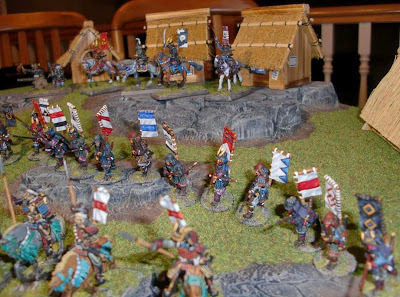 I plan to alter history a bit by allowing relief Ming Cavalry to arrive, as well as Korean Cavalry. The actual battle was mainly an infantry battle as far as I can tell. Although some very cool Korean artillery was used, like something called Water-Wheel Rock Cannon. Here are some WIP pictures of the table I started on this afternoon. A view of the fortress from the south east, with the village of Haengju in the foreground. This would be the main approach of the Japanese from Seoul. Seoul was within eyesight of the fortress, and the Korean defenders would've seen the advance of the Japanese. 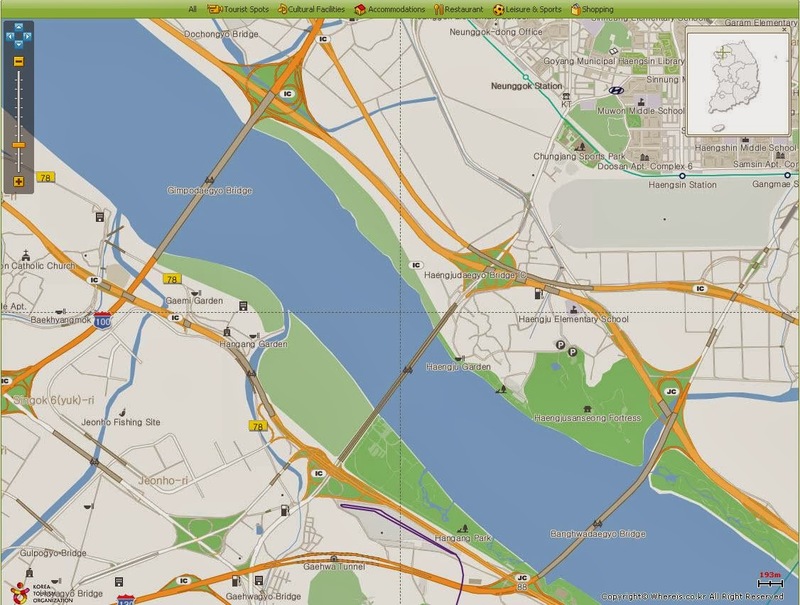 A modern map of the area - note how close the fortress is to the Han River. In fact, the fortuitous resupply of much needed arrows for Kwon Yul's forces arrived via the river late in the battle. A view of the fortress from the north west - note the rice paddies - these are very nice terrain pieces from Hotz Mats. A view of the fortress itself - it was a fortress from earlier times and parts of the wall were in ruin. An outer ring of stakes was added on Kwon Yul's orders - I will need to make some as part of the Korean forces will be outside of the stone walls. I used some foam core and pieces of packing foam to raise the height of the fortress proper. Since I had the re-based infantry out, I figured I'd add the rest of the armies for a photo op. All of these figures were painted a while ago, but don't get out of their barracks much. Up first, the invaders - an army under the command of Kuroda Nagamasa. Note, the banners are painted up by whim (mostly taken from the Siege of Osaka scroll), and not historical to the Nagamasa clan as far I know. Next a close up of Nagamasa and the generals of the three divisions. The large teppo cannon on the right flank is a Dixon model as is Nagamasa himself. 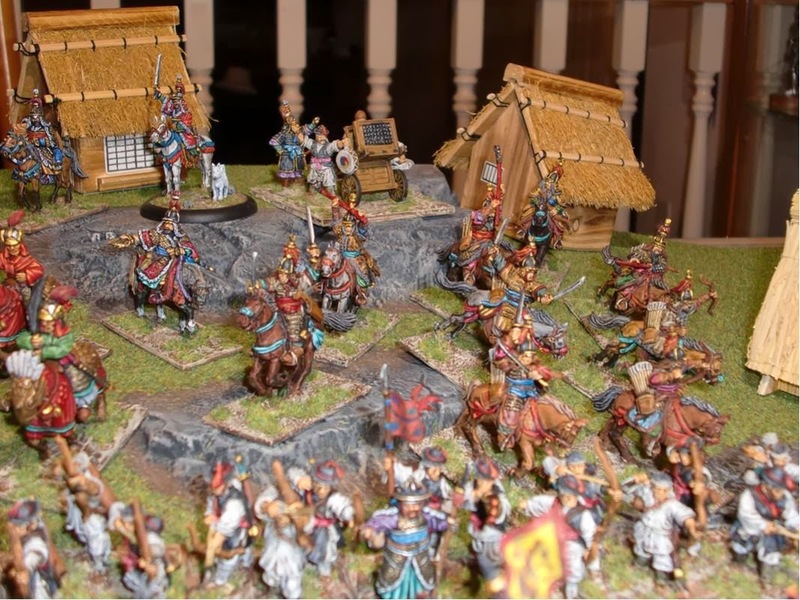 The generals are Perrys, as well as the foot samurai. The rest of the figures are Old Glory - the mounted samurai and ashigaru spearmen have plastic Wargames Factory banners. 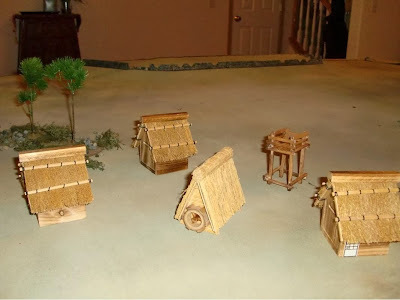 The huts are from a local thrift store here - which unfortunately no longer carries them. And now for the peaceful Hermit Kingdom - all Perry figures except for the Allied Ming Cavalry which are from The Assault Group (TAG). All the banners are from the Perry website. The Korean overall commander, Kwon Yul. This was the piece that started the whole army - along with the memorial figure of my dog, Changun. He's flanked by Hwa Cha rocket artillery. 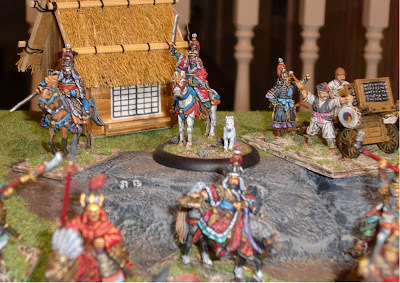 Samurai Cavalry - Medium Cavalry - Marauders (ignore distance penalty for command); Brave (Shaken unit rallies without an order). 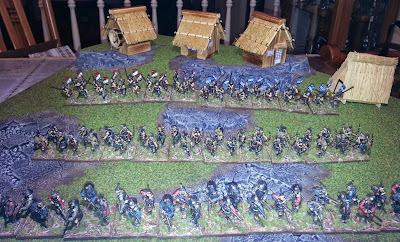 Samurai Infantry - Heavy Infantry - Tough Fighters (re-roll one missed combat attack); Stubborn (re-roll failed Morale saves). 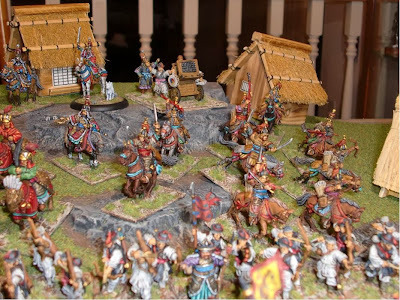 Ashigaru Spearmen - Medium Infantry - Drilled (free move on failed order; move through friends without disorder); Long Spears (charging enemy cavalry disordered on roll of 1,2 or 3; all chargers lose charge bonus). 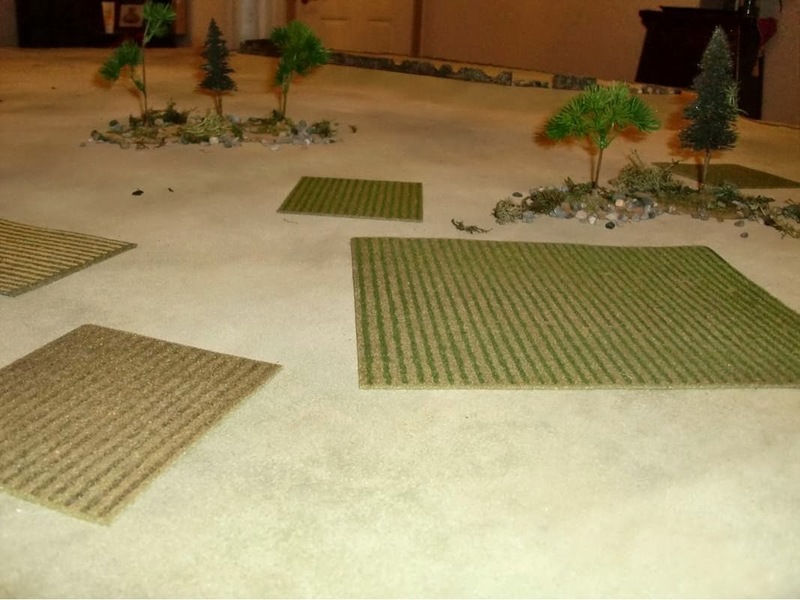 Ashigaru Bowmen - Light Infantry Archers - bow range 18"
Ashigaru Teppo - Light Infantry Archers (using Crossbow rules) - enemy Moral capped at 5+; enemy take automatic Break tests for casualties. Cannon - Medium Artillery - 36" range; same rules as teppo for hits. Ming Allied Cavalry - Heavy Cavalry - Marauders; Elite 4+ (recover from disorder on roll of 4+). Choson Cavalry - Medium Cavalry w/bows - Marauders; Feigned Flight (can move out of combat); Parthian Shot (can evade and move closing shots). Choson Government Infantry - Light Infantry - Double-handed weapons (enemy Morale capped at 5+). 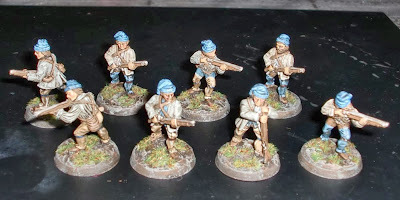 Choson Government Bowmen - Light Infantry Archers - Marksmen (re-roll one missed shot). Choson Militia Infantry - Light Infantry - Militia (no move on equal command rolls); Wavering (break test for taking casualties). Hwa Cha MLRS - Heavy Artillery - 48" range; enemy suffer -1 Morale save on missile hits. Anyway, these are just preliminary stats, as I'm sure after some playtesting things will change or be modified. Once I get some volunteer playtesters, I will be sure to post an AAR. 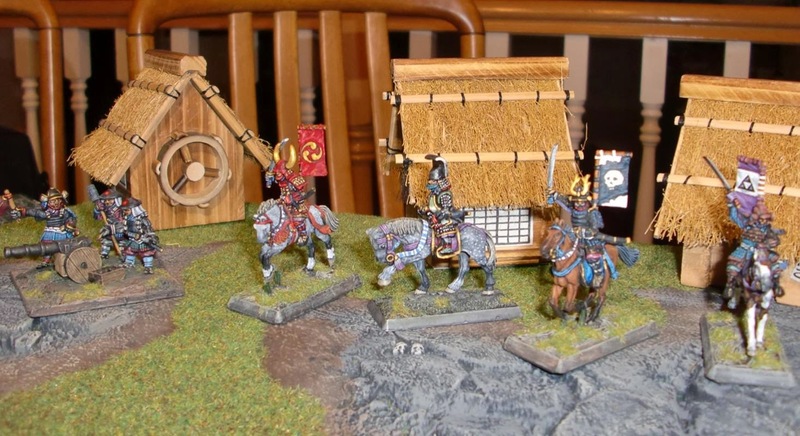 The Ashigaru and Choson infantry have been re-based on 40mm squares from Litko. The figures are based for Hail Shogun; a modified version of Hail Caesar. It's basically the same rules except less figures overall for units. 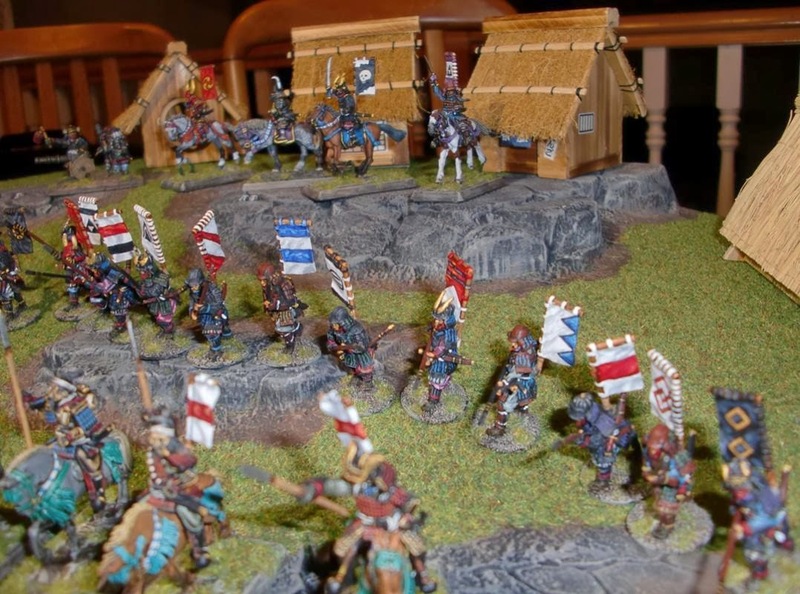 For instance, two to three bases of infantry will be a Standard sized unit. As both sides will be similarly sized, there should not be a problem. Anyway, here are the Choson Infantry: Militia and Government troops. 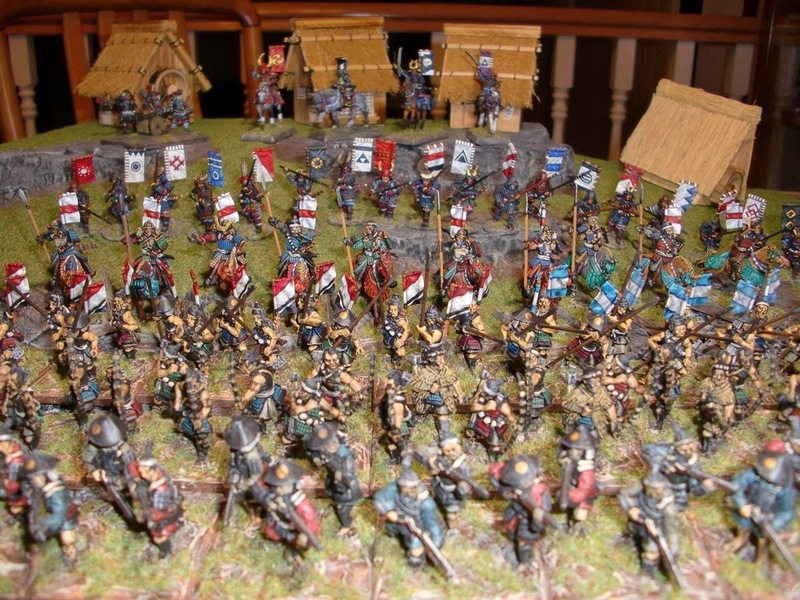 Here are the Ashigaru: Teppo, Archers and Spearmen. As you may be able to see, all of the Ashigaru and based 3-figures per 40mm square. This not only eased the position on the figures, but provided for more units. Planning to use Hail Caesar rules for an Imjin War game, I decided to re-base all of the Old Glory Japanese Ashigaru and Perry Choson Korean infantry onto Litko 40mm square bases. All of the figures were formerly based on metal washers. 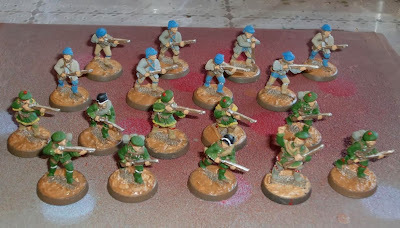 Here are the the Perry Koreans, less the archers, stuck onto the bases with acrylic caulking. Highlighted the green and red areas - also added some rouge to their cheeks to soften the look of the staining process. 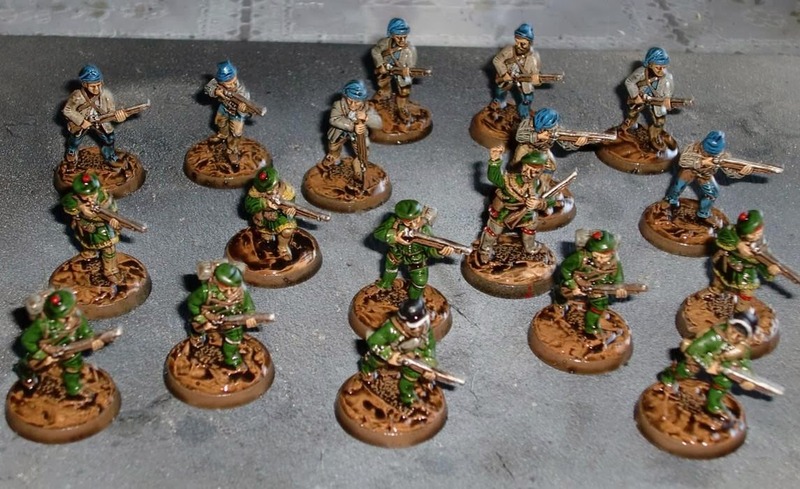 Here they are next to a couple of previously painted Foundry Grenadiers for comparison. They are pretty close in size and sculpting style. The main difference would be the poses - the Front Rank guys are more dynamically posed, but reflect the nature of their fighting style. Here are the Canadian Militia - a bit of highlight was added to their headgear and coats, but they still look rather scruffy; but this may be in keeping with their backwoods living. Next to Foundry French - again, same take as the British and Rangers. 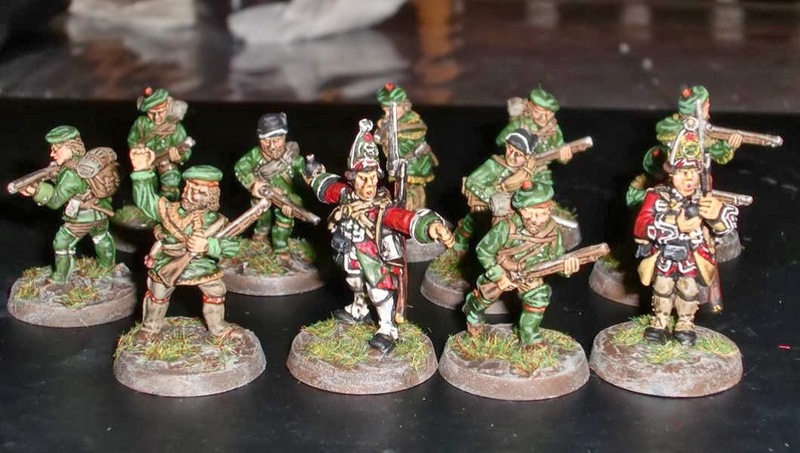 I may add some Native allies to the French forces, but probably should pick up the rules first. Hope you like these and thanks for visiting the blog. Wanted to post this WIP for a couple of reasons. One - to show that I'm still in the game and second - to show that I think my 40K/WHFB fling has somewhat cooled. I've been out of the net, so to speak, as I recently had another close family member pass away several weeks ago. I had to go to Hawaii for the funeral and provide some comfort to my family there. To pass the time on the flight over I took my copy of Hail Caesar to read. I was almost going to get a copy of White Dwarf to read, but didn't have the fire for it. Anyway, no sooner had I returned last week I looked for the Front Rank French & Indian War figures that Doug Hamm (aka Larry Leadhead) had practically given to me earlier in the year while I was at a convention up in Burnaby, B.C. The intended rules for these will be Muskets and Tomahawks, but the Hail Caesar read was inspiring for a return to Historicals, nonetheless.. 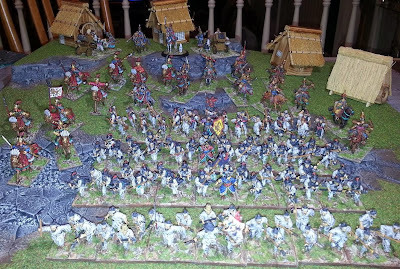 Anyway, sorry for the long lead in to this post, but here are the figures still dripping with Minwax Tudor Satin stain. Prior to the stain a quick block paint job was applied using mostly greys and blue for the French, and green and some red for the Rangers. By quick I mean they were done this morning in a couple of hours using mostly a fairly large brush. I only used a smaller tipped brush for the legging straps and the red band around some of the Rangers' berets. Speaking of leggings, the French aren't sculpted with them, so I just painted them up as such. 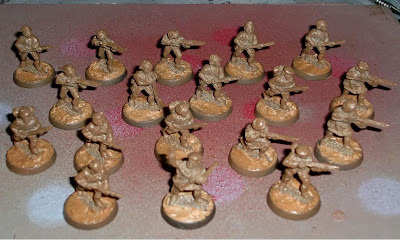 To speed up the process even more they were primed brown - Krylon Brown Boots from Walmart. 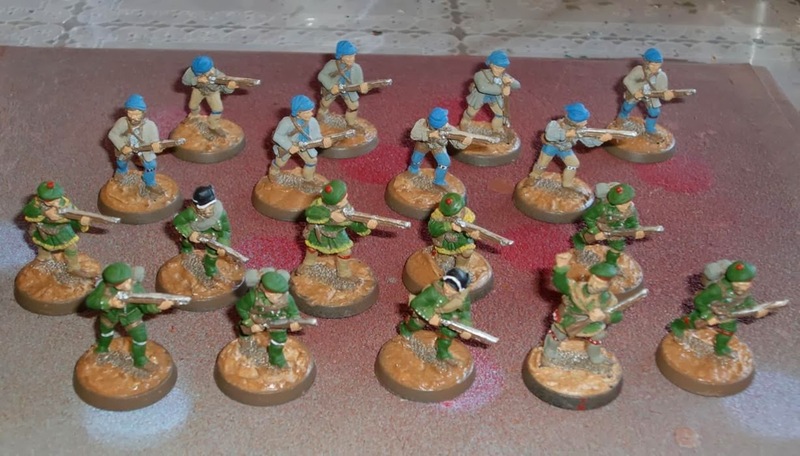 The undercoat is retained for the musket/rifle stocks, shoes, belts and straps. 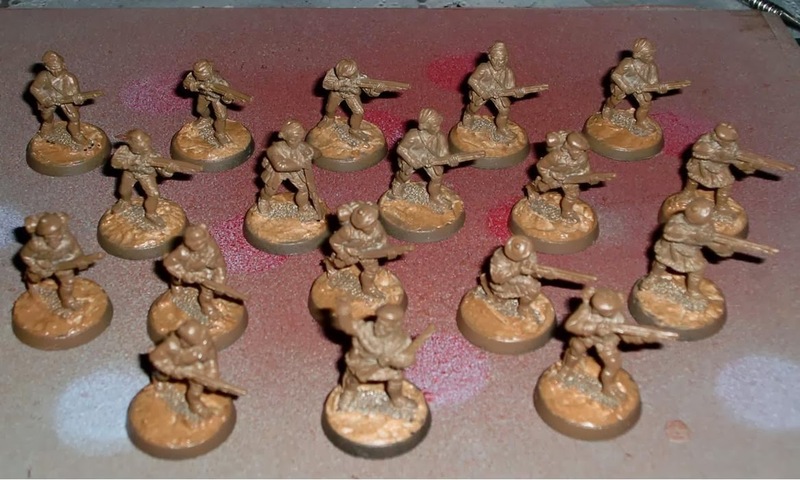 Once the stain is completely dry, they'll be sprayed with Testors Dullcote and the bases flocked. Here's the chapter so far - a Drop Pod would be a nice addition in the future. Two Land Speeders (one a relic), a Rhino, a relic Dreadnought, Captain, Chaplain, Techmarine, Command Squad, Terminator Squad and Tactical Squad. Added a few decals and bling items to, dare I say it, pimp my ride. GW fans will note the sword bearing griffons on the rear mounts are from the Fantasy Empire Watch Tower kit. They are pegged with brass rod and removable. 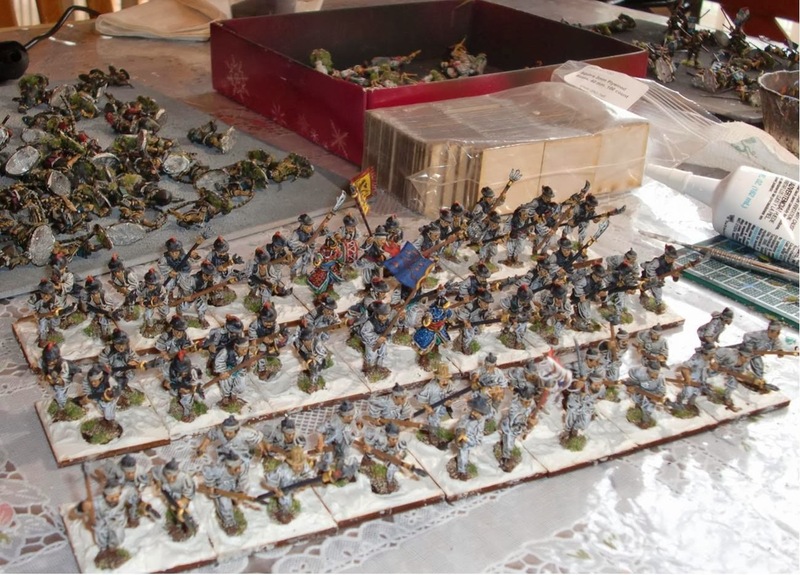 The two placards on the front glacis are from the Space Marines Command Squad kit. They are attached with blue tack and also removable. The arrow decals are also from the Command Squad kit - for shoulder guards, I think. The skull and caution stripe decals are from the Land Speeder kit, IIRC. 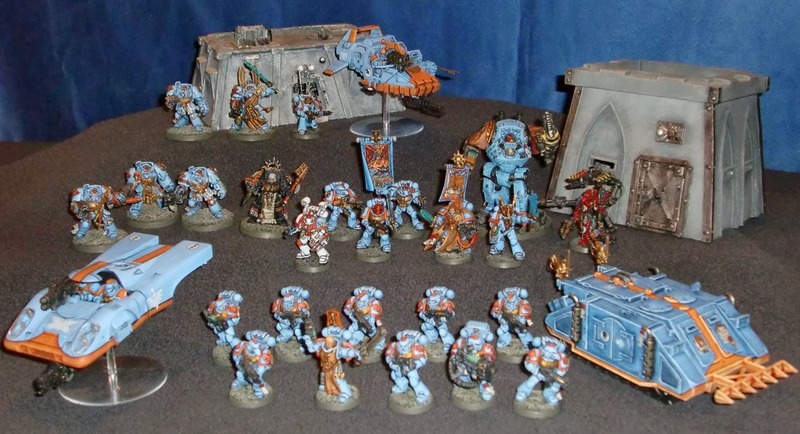 So, it is pretty much complete except for a storm bolter - which I'll likely get off of ebay someday. Here it is with the basic Marauders' chapter colors. Still need to paint the tracks, wheels and exhausts. After removing the original paint, it was sprayed with a black undercoat. The blue was dry-brushed on in gradually lighter finishes. I like the GW 'Eavy Metal way of highlighting edges - hadn't done this type of painting before, but it looks very appropriate for Space Marines stuff, IMO. I may add a heavy bolter to one of the hatches instead of the bolters on each of the hatches which originally came with the kit. Those older bolters look a bit small (whimpy) compared to current armament. Here's what it looked like after a couple of days soaking in DOT 3 brake fluid. Some of the fiddly stuff broke off due to vigorous use of a tooth brush to remove paint from some of the tighter areas. I replaced the top hatch handles with brass rod. The exhaust pipes were also strengthened with brass rod. Here is the figure made up of spare parts - the Auspex, legs, arms and torso from the Command Squad set, the head and bolter from a Ravenwing set. I don't have the current rulebook, but the the Auspex wasn't in the previous rulebook - which I have. EDIT: found this on the DAKKA DAKKA site: "According to the 6th Edition Space Marine codex, "A model with an auspex can use it in place of making a shooting attack. If he does so, target an enemy unit within 12" (this does not count as choosing a target for his unit to shoot at). A unit that is targeted by one or more auspexes has its cover saves reduced by 1 until the end of the phase." The antennae are scratch-built - the taller one is a brass rod with a base made from an Empire war hammer staff; the other one is a spare (unused) part from a Tamiya M10 kit - no idea what it was supposed to be. 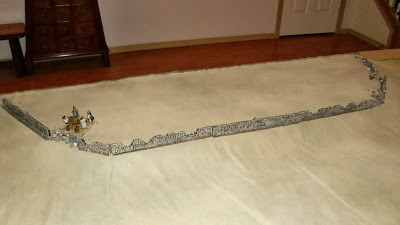 For the record: 'An Auspex is a short-ranged scanner used by Space Marines to detect hidden enemy troops.' Codex: Space Marines (4th ed. ), pg.23. I also have a Mk1 Rhino I picked up off of ebay that is soaking in DOT 3 brake fluid to take the paint off. I used Simple Green but it still wasn't peeling the paint off fast enough. 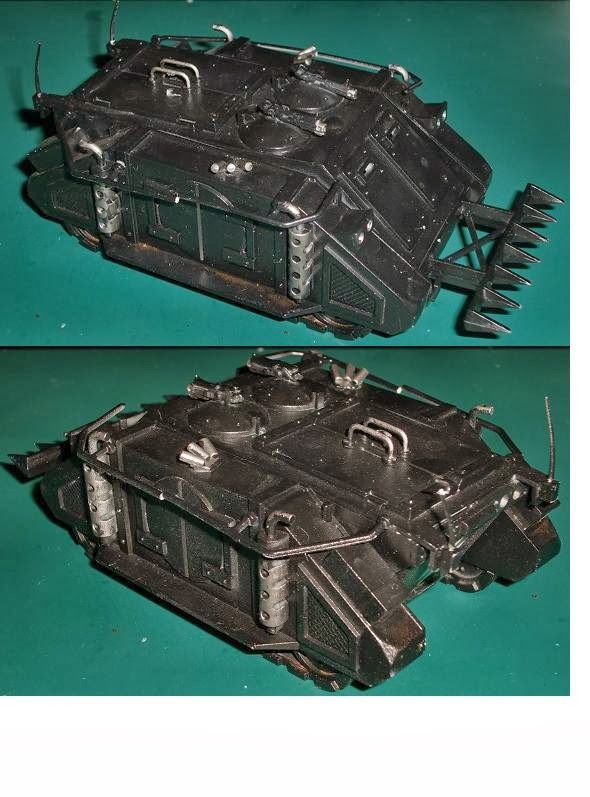 Here's what the tank looked like delivered - pretty good shape and had a cross decal for the Black Templars on the rear hatch.